How Are Syracuse Basketball Commits and Targets Performing on the EYBL Circuit? Without baseball, the summer is pretty tame on the SU hill. But away from it, Jim Boeheim and his staff has a chance to watch some potential future Orange players spike their stock on the prestigious Nike EYBL Circuit. Many players that have either committed to or been offered by Syracuse have been making their mark on the summer tour. Here’s how they’ve been performing so far this summer. Goodine is the lone commit so far in the Orange’s class and has been on a tear on the circuit. 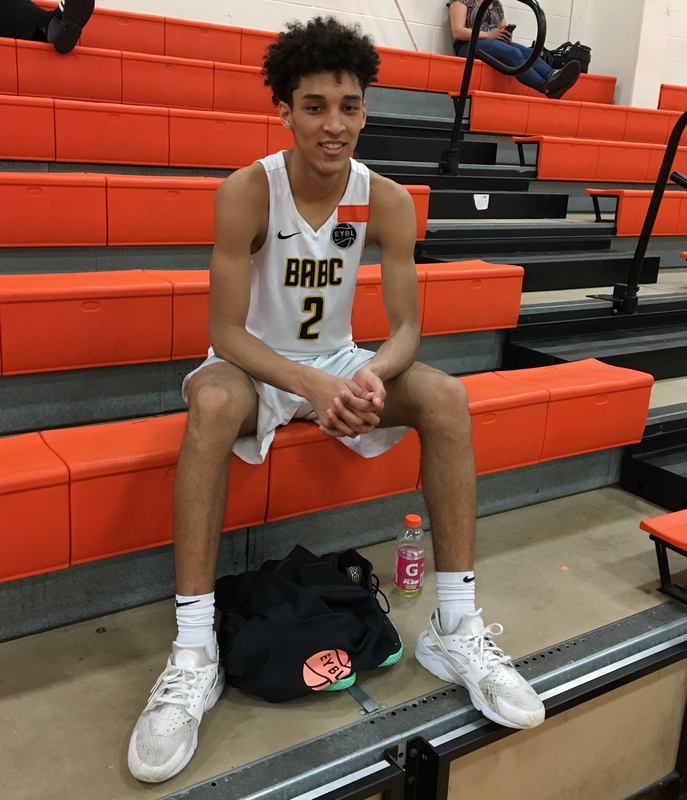 The Rhode Island Gatorade Player of the Year is playing for Boston Amateur Basketball Club (BABC) and has been playing his best ball as of late. Goodine has dropped 20 or more points in five of his last seven games. His 19.2 points per game and 39 three pointers made are both good for top 15 on the circuit. His performance was good enough to earn him All-Hampton Third Team at the latest session. Lecque is a top 15 prospect in the Class of 2019 and has put his scoring ability on display this summer. He’s the no. 2 combo guard in the country and has proven that on his New York Renaissance squad. The five star recruit leads his team in assists and trails fellow SU target Kofi Cockburn for the Renaissance points lead. One way for Lecque to catapult Cockburn would be by improving his three point stroke. He’s shooting just 10.5 percent from deep (4-for-38), despite having the second most attempts on the team. The marksman that has central New York excited is excelling on the perennial powerhouse Albany City Rocks. His 40 three pointers made is top 15 on the circuit. The three star has also launched more than twice as many triples (109) as the next highest guy on the team. His best games came early on, especially his 25 point performance against Woodz Elite. But Girard has struggled a little as of late, including his recent 0-for-7 three point outing in his most recent game, which is his lone contest without making a three. Girard’s 12.2 points per game is second on the team behind another SU target, Isaiah Stewart. Moore may be undersized for a small forward at just 6-foot-5, but he has played a lot bigger than his size. His scoring is among the best on the circuit at 17.6 points per game, but he also averages 6.5 rebounds per game. Playing for Team CP3, he leads the squad in points and rebounds and is second in assists. Those numbers slotted Moore on the All-Hampton First Team at the fourth session. Whitney is playing for Mac Irvin Fire out of his native home of Chicago. Mac Irvin has produced some of the best college players in recent memory such as Jabari Parker, Jahlil Okafor and Jalen Brunson. Whitney seems to be well on his way to etching his name alongside those three. He leads a high powered Fire offense in scoring and rebounding. Whitney sits inside the top 10 in scoring on the circuit and is one of a dozen players averaging at least 20 points. Akok has only played four games so far, but has been relatively effective. The forward has double digit points in three of his four contests for PSA Cardinals and had seven rebounds in his latest game. However, he is shining defensively. He blocked eight shots in his first three games, including a four block performance against New York Lightning. Stewart has been one of the most impressive big men on the tour for the Albany City Rocks, which is good news since he just slotted SU in his top 10. The Rochester native is a top 25 scorer and has pulled down the most rebounds this summer. He’s been so dominant, especially in Atlanta where he was named the Session’s MVP. Stewart is also one of two players averaging a double-double on the circuit. The other man averaging a double-double? It’s Cockburn. The four star recruit is a part of a talented group of centers in this 2019 class. We should be seeing his stock rise after this summer. Along with Wendell Moore, Cockburn also earned All-Hampton First Team honors. Cockburn has been a top-notch scorer to couple with his elite rebounding, which is second only to Isaiah Stewart. He leads New York Renaissance in both of those categories. Like I mentioned, it’ll be interesting to see where he winds up after this summer. He currently slots in as the 12th ranked center and 33rd best player for 2019, per 247Sports. Ajak hasn’t seen as much action as the rest of his Team Final teammates. However, he has appeared in more games that his teammate Khalif Battle, a Syracuse target turned Butler commit and brother of Tyus. Ajak has only appeared in 11 games this summer and hasn’t shown a lot in his limited time. This doesn’t come as much of a surprise, though. He is the lowest rated recruit that SU has offered.